Burning incense is a vital part of religious rituals, commonly found in almost all religions and so is the Lotus flower, which is also counted among the scared flowers in Hindu Tradition. We prepare Lotus Incense Sticks using solid scented materials combined with essential oils that release smoke and with that a fragrance, which offers an exhilarating experience. The soothing floral fragrance released by our Lotus scented Incense Stick makes it popular among spas, healthcare institutions, and therapeutic institutions. 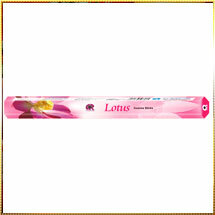 These Lotus fragrance Incense Sticks are also used to fight against bad odor. We check the quality of sticks on different health parameters to confirm that the regular inhalation of their smoke does not cause any harm. The lotus flavored Incense Sticks provided by us are properly packed that assure no fragrance loss during storage.